According to the website of cashless India, the Digital India programme is a flagship programme of the Government of India with a vision to transform India into a digitally empowered society and knowledge economy. “Faceless, Paperless, Cashless” is one of professed roles of Digital India. The ambitious mission of government of India to drive India towards a cashless economy was boosted with the announcement of demonetization on November 8, 2016. Yes, India is ready for a cashless economy. According to TRAI, as on 30 September 2016, 82 out of 100 citizens in India owned a mobile phone. The evolution of the telecom ecosystem, with significant reduction in call and data rates, along with the prices of smart phones, is propelling the shift to a cashless economy. 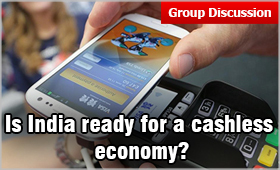 The government of India is working dedicatedly to push India towards a cashless economy. With major initiatives such as demonetization, Direct Benefit Transfers, BHIM and many more. The intent is to streamline the economy and curb corruption. The government approved for a proposal, under which there would be no charge for BHIM, UPI, and debit card transactions up to ₹2000. Government also ran a DigiDhan campaign where 16 lakh lucky winners (users and merchants) were rewarded with prizes ranging from Rs 1000 to 1 crore. Further to incentivize behavior change and bring down the cost of digital payments, referral and cash back schemes have also been launched for BHIM where users and merchants receive cash back. Also, initiatives like USSD and the *99# service have ensured that non-Smartphone users are also on board the cashless wave. 3X increase in the download of a leading mobile wallet app within 2 days of the demonetization announcement. 1 million: Number of newly saved credit and debit cards within two days of demonetization announcement. 100%: Day-on-day growth in customer enrolment with leading mobile wallets after demonetization. 30%: Increase in app usage and 50% increase in the download of wallets backed by leading banks. The above mentioned data clearly represent a shift towards a cashless economy. The smart phone revolution has led to the emergence of e-commerce, m-commerce and other services, including app-based cab aggregators, who encourage digital payments for use of various services. The value added services such as cash back, bill payment facilities, loyalty points, rewards and ease of use have resulted in surge of such digital platforms. These developments have given rise to a modern payment model.